Heat oven to 375°F. Grease bottoms and sides of three 10-oz custard cups or individual foil tart pans with 1 teaspoon of the butter. Spread 1 teaspoon remaining butter in bottom of each cup. Sprinkle brown sugar evenly over butter in cups. Place apple ring in each cup. Fill centers with cranberries. Place cups on cookie sheet with sides. Bake 8 to 10 minutes or until brown sugar bubbles. Meanwhile, place granulated sugar and apple juice concentrate in separate small bowls. Remove cookie sheet from oven. Dip all sides of each frozen biscuit into juice concentrate; roll in sugar to coat. Place biscuit on top of each apple ring. Sprinkle any remaining sugar over biscuits. Bake 20 to 25 minutes longer or until biscuits are golden brown. 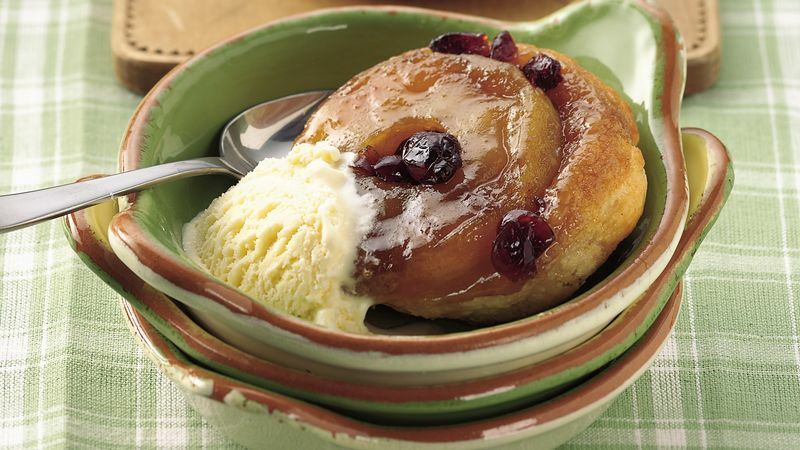 Serve in custard cups with ice cream, or turn upside down into dessert bowls. These individual desserts, just right for a small family, are similar to fruit dumplings. Other flavors of Pillsbury® Oven Baked frozen biscuits, such as buttermilk or Butter Tastin'®, also work for this recipe.